The Watt steam engine, alternatively known as the Boulton and Watt steam engine, was the first practical steam engine and was one of the driving forces of the industrial revolution. James Watt developed the design sporadically from 1763 to 1775 with support from Matthew Boulton. Watt's design saved significantly more fuel compared to earlier designs that they were licensed based on the amount of fuel they would save. Watt never ceased developing the steam engine, introducing double-acting designs (with two cylinders) and various systems for taking off rotary power. Watt's design became synonymous with steam engines, and it was many years before significantly new designs began to replace the basic Watt design. 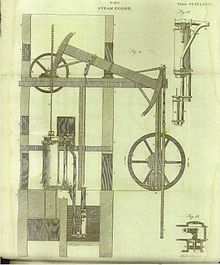 The first steam engines, introduced by Thomas Newcomen in 1712, were of the "atmospheric" design. Steam was introduced into a cylinder which was then cooled by a spray of water. This caused the steam to condense, forming a partial vacuum in the cylinder. Atmospheric pressure on the top pushed the piston down. Watt noticed that the water spray also cooled the cylinder itself, and it required significant amounts of heat to warm it back up to the point where steam could enter the cylinder without immediately condensing again. Watt addressed this by adding a separate water-filled cylinder which was opened once the main cylinder was filled. The steam entered the secondary cylinder and condensed, drawing remaining steam from the main cylinder to continue the process. The end result was the same cycle as Newcomen's design, but without any cooling of the main cylinder which was immediately ready for another stroke. Watt worked on the design over a period of several years, introducing the condenser and improvements to practically every part of the design, notably a lengthy series of trials on ways to seal the piston in the cylinder. All of these changes produced a more reliable design which used half as much coal to produce the same amount of power. 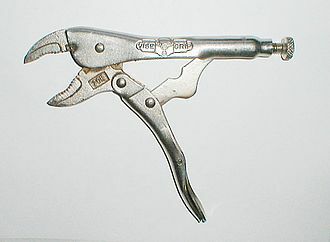 The new design was introduced commercially in 1776, with the first example sold to the Carron Company ironworks. Watt continued working to improve the engine, and in 1781 introduced a system using a sun and planet gear to turn the linear motion of the engines into rotary motion. This made it useful not only in the original pumping role, but also as a direct replacement in roles where a water wheel would have been used previously. This was a key moment in the industrial revolution, since power sources could now be located anywhere instead of, as previously, needing a suitable water source and topography. 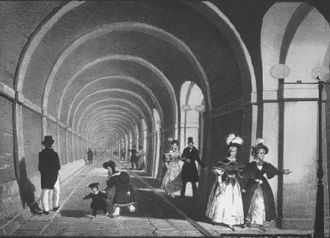 Boulton began developing a multitude of machines that made use of this rotary power, developing the first modern industrialized factory, the Soho Foundry, which in turn produced new steam engine designs. Watt's early engines were like the original Newcomen designs in that they used low-pressure steam and most of the action was caused by atmospheric pressure, due mostly to safety concerns. Looking to improve on their performance, Watt began considering the use of higher-pressure steam, as well as designs using multiple cylinders in both the double-acting concept and the multiple-expansion concept. These double-acting engines required the invention of the parallel motion, which allowed the piston rods of the individual cylinders to move in straight lines, keeping the piston true in the cylinder, while the walking beam end moved through an arc, somewhat analogous to a crosshead in later steam engines. In 1698, the English mechanical designer Thomas Savery invented a pumping appliance that used steam to draw water directly from a well by means of a vacuum created by condensing steam. The appliance was also proposed for draining mines, but it could only draw fluid up approximately 25 feet, meaning it had to be located within this distance of the mine floor being drained. As mines became deeper, this was often impractical. It also consumed a large amount of fuel compared with later engines. The solution to draining deep mines was found by Thomas Newcomen who developed an "atmospheric" engine that also worked on the vacuum principle. It employed a cylinder containing a movable piston connected by a chain to one end of a rocking beam that worked a mechanical lift pump from its opposite end. At the bottom of each stroke, steam was allowed to enter the cylinder below the piston. As the piston rose within the cylinder, drawn upward by a counterbalance, it drew in steam at atmospheric pressure. At the top of the stroke the steam valve was closed, and cold water was briefly injected into the cylinder as a means of cooling the steam. This water condensed the steam and created a partial vacuum below the piston. The atmospheric pressure outside the engine was then greater than the pressure within the cylinder, thereby pushing the piston into the cylinder. The piston, attached to a chain and in turn attached to one end of the "rocking beam", pulled down the end of the beam, lifting the opposite end of the beam. Hence, the pump deep in the mine attached to opposite end of the beam via ropes and chains was driven. The pump pushed, rather than pulled the column of water upward, hence it could lift water any distance. Once the piston was at the bottom, the cycle repeated. 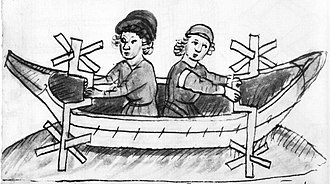 The Newcomen engine was more powerful than the Savery engine. For the first time water could be raised from a depth of over 150 feet. 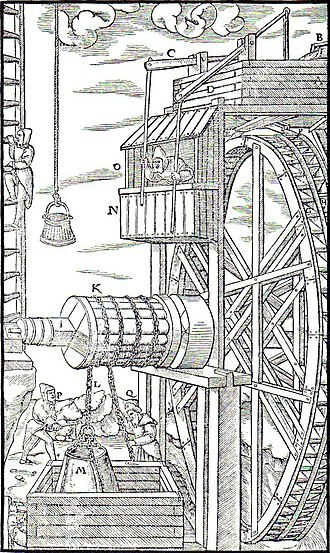 The first example from 1712 was able to replace a team of 500 horses that had been used to pump out the mine. Seventy-five Newcomen pumping engines were installed at mines in Britain, France, Holland, Sweden and Russia. In the next fifty years only a few small changes were made to the engine design. It was a great advancement. While Newcomen engines brought practical benefits, they were inefficient in terms of the use of energy to power them. The system of alternately sending jets of steam, then cold water into the cylinder meant that the walls of the cylinder were alternately heated, then cooled with each stroke. Each charge of steam introduced would continue condensing until the cylinder approached working temperature once again. So at each stroke part of the potential of the steam was lost. In 1763, James Watt was working as instrument maker at the University of Glasgow when he was assigned the job of repairing a model Newcomen engine and noted how inefficient it was. In 1765, Watt conceived the idea of equipping the engine with a separate condensation chamber, which he called a "condenser". Because the condenser and the working cylinder were separate, condensation occurred without significant loss of heat from the cylinder. The condenser remained cold and below atmospheric pressure at all times, while the cylinder remained hot at all times. Steam was drawn from the boiler to the cylinder under the piston. When the piston reached the top of the cylinder, the steam inlet valve closed and the valve controlling the passage to the condenser opened. The condenser being at a lower pressure, drew the steam from the cylinder into the condenser where it cooled and condensed from water vapor to liquid water, maintaining a partial vacuum in the condenser that was communicated to the space of the cylinder by the connecting passage. External atmospheric pressure then pushed the piston down the cylinder. The separation of the cylinder and condenser eliminated the loss of heat that occurred when steam was condensed in the working cylinder of a Newcomen engine. This gave the Watt engine greater efficiency than the Newcomen engine, reducing the amount of coal consumed while doing the same amount of work as a Newcomen engine. At each stroke the warm condensate was drawn off from the condenser and sent to a hot well by a vacuum pump, which also helped to evacuate the steam from under the power cylinder. The still-warm condensate was recycled as feedwater for the boiler. These improvements led to the fully developed version of 1776 that actually went into production. The separate condenser showed dramatic potential for improvements on the Newcomen engine but Watt was still discouraged by seemingly insurmountable problems before a marketable engine could be perfected. It was only after entering into partnership with Matthew Boulton that such became reality. 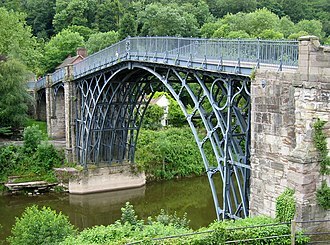 Watt told Boulton about his ideas on improving the engine, and Boulton, an avid entrepreneur, agreed to fund development of a test engine at Soho, near Birmingham. At last Watt had access to facilities and the practical experience of craftsmen who were soon able to get the first engine working. As fully developed, it used about 75% less fuel than a similar Newcomen one. In 1775, Watt designed two large engines: one for the Bloomfield Colliery at Tipton, completed in March 1776, and one for John Wilkinson's ironworks at Willey, Shropshire, which was at work the following month. A third engine, at Stratford-le-Bow in east London, was also working that summer. Watt had tried unsuccessfully for several years to obtain an accurately bored cylinder for his steam engines, and was forced to use hammered iron, which was out of round and caused leakage past the piston. Joseph Wickham Roe stated in 1916: "When [John] Smeaton saw the first engine he reported to the Society of Engineers that 'Neither the tools nor the workmen existed who could manufacture such a complex machine with sufficient precision'". In 1774, John Wilkinson invented a boring machine in which the shaft that held the cutting tool was supported on both ends and extended through the cylinder, unlike the cantilevered borers then in use. Boulton wrote in 1776 that "Mr. Wilkinson has bored us several cylinders almost without error; that of 50 inches diameter, which we have put up at Tipton, does not err on the thickness of an old shilling in any part". Boulton and Watt's practice was to help mine-owners and other customers to build engines, supplying men to erect them and some specialised parts. However, their main profit from their patent was derived from charging a licence fee to the engine owners, based on the cost of the fuel they saved. The greater fuel efficiency of their engines meant that they were most attractive in areas where fuel was expensive, particularly Cornwall, for which three engines were ordered in 1777, for the Wheal Busy, Ting Tang, and Chacewater mines. The first Watt engines were atmospheric pressure engines, like the Newcomen engine but with the condensation taking place separate from the cylinder. Driving the engines using both low pressure steam and a partial vacuum raised the possibility of reciprocating engine development. An arrangement of valves could alternately admit low pressure steam to the cylinder and then connect with the condenser. Consequently, the direction of the power stroke might be reversed, making it easier to obtain rotary motion. Additional benefits of the double acting engine were increased efficiency, higher speed (greater power) and more regular motion. Before the development of the double acting piston, the linkage to the beam and the piston rod had been by means of a chain, which meant that power could only be applied in one direction, by pulling. This was effective in engines that were used for pumping water, but the double action of the piston meant that it could push as well as pull. This was not possible as long as the beam and the rod were connected by a chain. Furthermore, it was not possible to connect the piston rod of the sealed cylinder directly to the beam, because while the rod moved vertically in a straight line, the beam was pivoted at its centre, with each side inscribing an arc. To bridge the conflicting actions of the beam and the piston, Watt developed his parallel motion. 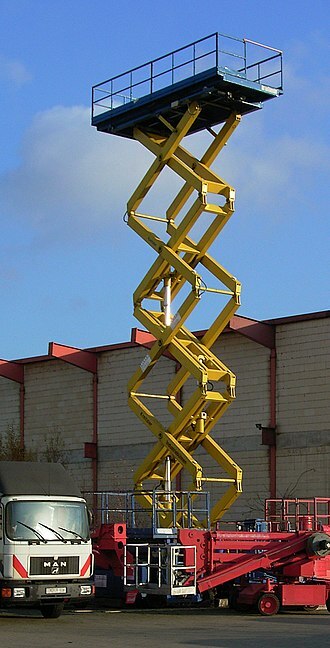 This masterpiece of engineering uses a four bar linkage coupled with a pantograph to produce the required straight line motion much more cheaply than if he had used a slider type of linkage. He was very proud of his solution. Having the beam connected to the piston shaft by a means that applied force alternately in both directions also meant that it was possible to use the motion of the beam to turn a wheel. 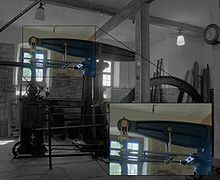 The simplest solution to transforming the action of the beam into a rotating motion was to connect the beam to a wheel by a crank, but because another party had patent rights on the use of the crank, Watt was obliged to come up with another solution. He adopted the epicyclic sun and planet gear system suggested by an employee William Murdoch, only later reverting, once the patent rights had expired, to the more familiar crank seen on most engines today. The main wheel attached to the crank was large and heavy, serving as a flywheel which, once set in motion, by its momentum maintained a constant power and smoothed the action of the alternating strokes. To its rotating central shaft, belts and gears could be attached to drive a great variety of machinery. Because factory machinery needed to operate at a constant speed, Watt linked a steam regulator valve to a centrifugal governor which he adapted from those used to automatically control the speed of windmills. The centrifugal was not a true speed controller because it could not hold a set speed in response to a change in load. These improvements allowed the steam engine to replace the water wheel and horses as the main sources of power for British industry, thereby freeing it from geographical constraints and becoming one of the main drivers in the Industrial Revolution. Watt was also concerned with fundamental research on the functioning of the steam engine. 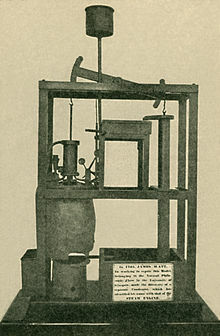 His most notable measuring device, still in use today, is the Watt indicator incorporating a manometer to measure steam pressure within the cylinder according to the position of the piston, enabling a diagram to be produced representing the pressure of the steam as a function of its volume throughout the cycle. 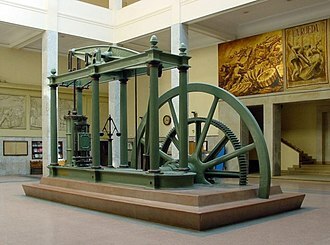 The oldest surviving Watt engine is Old Bess of 1777, now in the Science Museum, London. The oldest working engine in the world is the Smethwick Engine, brought into service in May 1779 and now at Thinktank in Birmingham (formerly at the now defunct Museum of Science and Industry, Birmingham). The oldest still in its original engine house and still capable of doing the job for which it was installed is the 1812 Boulton and Watt engine at the Crofton Pumping Station. This was used to pump water for the Kennet and Avon Canal; on certain weekends throughout the year the modern pumps are switched off and the two steam engines at Crofton still perform this function. The oldest extant rotative steam engine, the Whitbread Engine (from 1785, the third rotative engine ever built), is located in the Powerhouse Museum in Sydney, Australia. A Boulton-Watt engine of 1788 may be found in the Science Museum, London., while an 1817 blowing engine, formerly used at the Netherton ironworks of M W Grazebrook now decorates Dartmouth Circus, a traffic island at the start of the A38(M) motorway in Birmingham. The Henry Ford Museum in Dearborn, Michigan houses a replica of a 1788 Watt rotative engine. It is a full-scale working model of a Boulton-Watt engine. The American industrialist Henry Ford commissioned the replica engine from the English manufacturer Charles Summerfield in 1932. The museum also holds an original Boulton and Watt atmospheric pump engine, originally used for canal pumping in Birmingham, illustrated below, and in use in situ at the Bowyer Street pumping station from 1796 until 1854, and afterwards removed to Dearborn in 1929. In the 1880s, Hathorn Davey and Co / Leeds produced a 1 hp / 125 rpm atmospheric engine with external condenser but without steam expansion. It has been argued that this was probably the last commercial atmospheric engine to be manufactured. As an atmospheric engine, it did not have a pressurized boiler. It was intended for small businesses. Watt's Expansion Engine is generally considered as of historic interest only. There are however some recent developments which may lead to a renaissance of the technology. Today, there is an enormous amount of waste steam and waste heat with temperatures between 100 and 150 °C generated by industry. In addition, solarthermal collectors, geothermal energy sources and biomass reactors produce heat in this temperature range. There are technologies to utilise this energy, in particular the Organic Rankine Cycle. In principle, these are steam turbines which do not use water but a fluid (a refrigerant) which evaporates at temperatures below 100 °C. Such systems are however fairly complex. They work with pressures of 6 to 20 bars, so that the whole system has to be completely sealed. The Expansion Engine can offer significant advantages here, in particular for lower power ratings of 2 to 100 kW: with expansion ratios of 1:5, the theoretical efficiency reaches 15%, which is in the range of ORC systems. The Expansion Engine uses water as working fluid which is simple, cheap, not toxic, nonflammable and not corrosive. It works at pressure near and below atmospheric, so that sealing is not a problem. And it is a simple machine, implying cost effectiveness. Researchers from the University of Southampton / UK are currently developing a modern version of Watt's engine in order to generate energy from waste steam and waste heat. They improved the theory, demonstrating that theoretical efficiencies of up to 17.4% (and actual efficiencies of 11%) are possible. In order to demonstrate the principle, a 25 watt experimental model engine was built and tested. The engine incorporates steam expansion as well as new features such as electronic control. The picture shows the model built and tested in 2016. Currently, a project to build and test a 2 kW engine is under preparation. 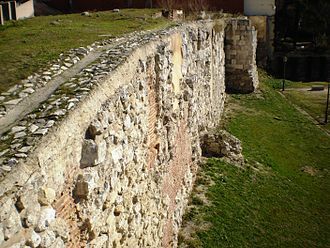 An example of how it was built with its material. ^ Ayres, Robert (1989). "Technological Transformations and Long Waves" (PDF): 13. ^ a b Dickinson, Henry Winram (1939). A Short History of the Steam Engine. Cambridge University Press. p. 87. ISBN 978-1-108-01228-7. ^ a b Farey, John (1827-01-01). A treatise on the steam engine : historical, practical, and descriptive. London : Printed for Longman, Rees, Orme, Brown and Green. pp. 339 ff. ^ Hulse David K (1999): "The early development of the steam engine"; TEE Publishing, Leamington Spa, U.K., ISBN, 85761 107 1 p. 127 et seq. ^ R. L. Hills, James Watt: II The Years of Toil, 1775–1785 (Landmark, Ashbourne, 2005), 58–65. ^ a b Roe, Joseph Wickham (1916), English and American Tool Builders, New Haven, Connecticut: Yale University Press, LCCN 16011753 . Reprinted by McGraw-Hill, New York and London, 1926 (LCCN 27-24075); and by Lindsay Publications, Inc., Bradley, Illinois, (ISBN 978-0-917914-73-7). ^ Hulse David K (2001): "The development of rotary motion by the steam power"; TEE Publishing, Leamington Spa, U.K., ISBN 1 85761 119 5 : p 58 et seq. ^ Thurston, Robert H. (1875). A History of the Growth of the Steam-Engine. D. Appleton & Co. p. 116. This is the first edition. Modern paperback editions are available. ^ Bennett, S. (1979). A History of Control Engineering 1800-1930. London: Peter Peregrinus Ltd. pp. 47, 22. ISBN 0-86341-047-2. ^ "Rotative steam engine by Boulton and Watt, 1788". Science Museum. ^ "Davey's engine of 1885". ^ Müller, Gerald (2015). 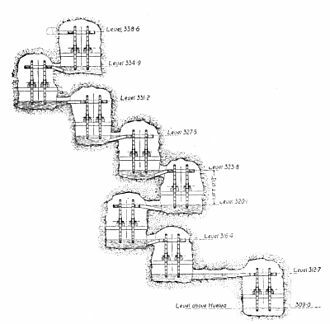 "Experimental investigation of the atmospheric steam engine with forced expansion" (PDF). Renewable Energy. 75: 348–355. doi:10.1016/j.renene.2014.09.061. Retrieved 5 March 2018. Watt's 'perfect engine' – excerpts from Transactions of the Newcomen Society. Chacewater is a village and civil parish in Cornwall, England, UK. It is situated approximately 3 miles east of Redruth, the hamlets of Carnhot, Cox Hill, Hale Mills, Jollys Bottom, Saveock, Todpool and Wheal Busy are in the parish. The electoral ward is called Chacewater & Kenwyn, at the 2011 census a population of 3,870 was quoted. Chacewater sits in a valley between hills separating it from the villages of Threemilestone, Scorrier and St Day, nearby is Wheal Busy, the Poldice Valley and the Coast to Coast cycle route. The village has three pubs and a club, the Chacewater Literary Institute, there are a health centre, primary school, village hall and small selection of shops. A free monthly magazine Whats on in Chacewater reached its 200th issue in July 2007, the Kernow Microscopical Society meets in Chacewater. Chacewater railway station was opened by the West Cornwall Railway on 25 August 1852, the station closed to passengers on 5 October 1964 but continued to be served by goods traffic for many years, latterly for Blue Circle Cement. Now owned by Avery Weigh-Tronix, it is used for the manufacture of weighing machines. The early history of the Soho Foundry is of importance both to the history of the industrial revolution and to the study of the development of management theory. The factory was built on the edge of the Birmingham Canal on land bought in 1795, the following year the foundry was open. The Soho Foundry was planned with a degree of sophistication unprecedented for a factory of its time and these tasks took place in a series of workshops spatially located along the flow of production, minimising the expense and time-wastage of the movement of materials through the works. The Soho Foundry was innovative in the field of management, setting up executive development programmes, sickness benefit schemes. In 1912, the manager of the company William Edward Hipkins and he was 55 and his body was not recovered. By 1840 James Watt Jr. owned the factory after the death of the founding Boulton and he died in 1848 and his place was taken by H. W.
Blake and the name changed from Soho Foundry to James Watt & Co. 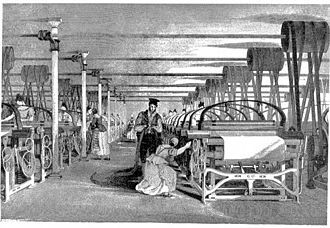 In 1857 the screw engines for the steamship SS Great Eastern were built at the foundry, in 1860 a new mint was started at the Foundry, the Manufactory having closed in April 1850 by Matthews grandson, Matthew Piers Watt Boulton. In 1861 tests were performed at the Soho Foundry for the London Pneumatic Despatch Company, in 1895 W & T Avery Ltd. acquired the Foundry as a going concern. It is now the home of Avery Weigh-Tronix and Avery Berkel, the site includes William Murdochs cottage and overlooks Black Patch Park. There was a museum there, open only by appointment. A plaque reads, These gates were cast by Henry Pooley and Son about 1840 for the Sailors Home, the Avery and Pooley Foundries were amalgamated in 1931. There was a campaign to return these gates to Liverpool. The building is a Grade II* listed building, the gates and adjacent canal bridge are Grade II listed. The oldest working engine, built here, is the Smethwick Engine built to recover water used in the nearby canal locks at Smethwick Summit. Condensation is the change of the physical state of matter from gas phase into liquid phase, and is the reverse of evaporation. The word most often refers to the water cycle and it can be defined as the change in the state of water vapour to liquid water when in contact with a liquid or solid surface or cloud condensation nuclei within the atmosphere. When the transition happens from the phase into the solid phase directly. A few distinct reversibility scenarios emerge here with respect to the nature of the surface, absorption into the surface of a liquid —is reversible as evaporation. Adsorption onto solid surface at pressures and temperatures higher than the species triple point—also reversible as evaporation, adsorption onto solid surface at pressures and temperatures lower than the species triple point—is reversible as sublimation. Condensation commonly occurs when a vapor is cooled and/or compressed to its limit when the molecular density in the gas phase reaches its maximal threshold. Vapor cooling and compressing equipment that collects condensed liquids is called a condenser, psychrometry measures the rates of condensation through evaporation into the air moisture at various atmospheric pressures and temperatures. Water is the product of its vapor condensation—condensation is the process of such phase conversion, condensation is a crucial component of distillation, an important laboratory and industrial chemistry application. Because condensation is a naturally occurring phenomenon, it can often be used to water in large quantities for human use. Many structures are made solely for the purpose of collecting water from condensation, such as air wells and it is a crucial process in forming particle tracks in a cloud chamber. In this case, ions produced by an incident particle act as centers for the condensation of the vapor producing the visible cloud trails. Furthermore, condensation is a step in many industrial processes, such as power generation, water desalination, thermal management, refrigeration. During the 18th century the mine produced enormous amounts of copper ore and was very wealthy, but from the 19th century onwards was not profitable. Today the site of the mine is part of the Cornwall, the country rock at the mine was killas and the mines main product was copper, though arsenic and tin were produced. There are several lodes at the mine, some of which were crossed by a dyke,15 to 40 ft wide which in places was highly mineralized. There were probably mine workings in the area of Wheal Busy since the 16th century, the principal landowner was the Boscawen family. The mine was located in what was known at the time as the richest square mile on Earth, during its life it produced over 100,000 tons of copper ore, and 27,000 tons of arsenic. The mine adopted the name of Wheal Busy after 1823, at one time the mine smelted the copper ore it produced. The mine suffered badly from water and in order to pump it out. In 1775 this was replaced by a 72 inch engine designed by John Smeaton which was not very effective and was rebuilt by James Watt in 1778, in 1778, the mine benefited from being connected to the Great County Adit, which helped drainage. To celebrate a restarting of the mine in 1856, a gargantuan feast was held in the village of Chacewater, watched by crowds, a thousand people marched through the village to the mine where the cornerstone for a large new engine house was laid. There was a train on the West Cornwall Railway, a church service, a dinner was provided for 400 poor people. The feast itself took place in the marketplace and involved the roasting of a whole ox, although large quantities of copper and tin ore were produced in the following ten years, no overall profit was made and the adventurers lost more than £150,000 in the mine. The mine closed shortly afterwards. In the 1850s the water drawn from the mine was being used for the steam engines and it was not until 1862 that a supply of clean water was arranged to solve this problem. The last significant production of ore from the mine was in 1866. Only seven months after it started work the engine was up for sale, in around 1910 the mine installed a second-hand 85 inch pumping engine, and to help with its production of arsenic, a Brunton calciner was built. A piston is a component of reciprocating engines, reciprocating pumps, gas compressors and pneumatic cylinders, among other similar mechanisms. It is the component that is contained by a cylinder and is made gas-tight by piston rings. In an engine, its purpose is to force from expanding gas in the cylinder to the crankshaft via a piston rod and/or connecting rod. In a pump, the function is reversed and force is transferred from the crankshaft to the piston for the purpose of compressing or ejecting the fluid in the cylinder, in some engines, the piston acts as a valve by covering and uncovering ports in the cylinder wall. An internal combustion engine is acted upon by the pressure of the combustion gases in the combustion chamber space at the top of the cylinder. This force acts downwards through the rod and onto the crankshaft. The connecting rod is attached to the piston by a swivelling gudgeon pin and this pin is mounted within the piston, unlike the steam engine, there is no piston rod or crosshead. The pin itself is of hardened steel and is fixed in the piston, a few designs use a fully floating design that is loose in both components. All pins must be prevented from moving sideways and the ends of the pin digging into the cylinder wall, gas sealing is achieved by the use of piston rings. These are a number of iron rings, fitted loosely into grooves in the piston. The rings are split at a point in the rim, allowing them to press against the cylinder with a light spring pressure. Two types of ring are used, the rings have solid faces and provide gas sealing, lower rings have narrow edges. There are many proprietary and detail design features associated with piston rings, pistons are cast from aluminium alloys. For better strength and fatigue life, some racing pistons may be forged instead, early pistons were of cast iron, but there were obvious benefits for engine balancing if a lighter alloy could be used. To produce pistons that could survive engine combustion temperatures, it was necessary to develop new alloys such as Y alloy and Hiduminium, a few early gas engines had double-acting cylinders, but otherwise effectively all internal combustion engine pistons are single-acting. Reciprocating engine cylinders are often classified by whether they are single- or double-acting, depending on how the working fluid acts on the piston. A single-acting cylinder in an engine is a cylinder in which the working fluid acts on one side of the piston only. A single-acting cylinder relies on the load, other cylinders, or the momentum of a flywheel, single-acting cylinders are found in most kinds of reciprocating engine. They are almost universal in internal combustion engines and are used in many external combustion engines such as Stirling engines. They are found in pumps and hydraulic rams, a double-acting cylinder is a cylinder in which the working fluid acts alternately on both sides of the piston. Double-acting cylinders are common in steam engines but unusual in other engine types, many hydraulic and pneumatic cylinders use them where it is needed to produce a force in both directions. A double-acting hydraulic cylinder has a port at each end, supplied with hydraulic fluid for both the retraction and extension of the piston. A double-acting cylinder is used where a force is not available to retract the piston or where high force is required in both directions of travel. Steam engines normally use double-acting cylinders, early steam engines, such as atmospheric engines and some beam engines were single-acting. These often transmitted their force through the beam by means of chains, where these were used for pumping mine shafts and only had to act against a load in one direction, single-acting designs remained in use for many years. The main impetus towards double-acting cylinders came when James Watt was trying to develop a rotative beam engine, with a single-cylinder engine, a double-acting cylinder gave a smoother power output. The high-pressure engine, as developed by Richard Trevithick, used double-acting pistons, some of the steam engines, the high-speed steam engines, used single-acting pistons of a new design. 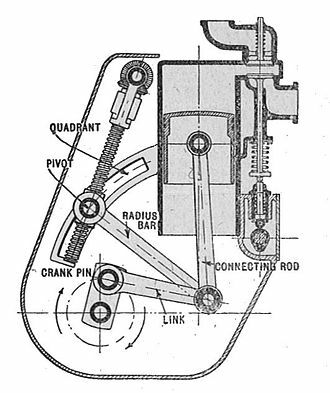 The crosshead became part of the piston, and there was no longer any piston rod and this was for similar reasons to the internal combustion engine, as avoiding the piston rod and its seals allowed a more effective crankcase lubrication system. Atmospheric pressure, sometimes called barometric pressure, is the pressure exerted by the weight of air in the atmosphere of Earth. In most circumstances atmospheric pressure is approximated by the hydrostatic pressure caused by the weight of air above the measurement point. As elevation increases, there is less overlying atmospheric mass, so that atmospheric pressure decreases with increasing elevation. 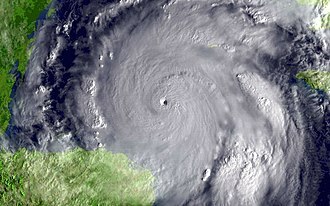 On average, a column of air one square centimetre in cross-section, measured from sea level to the top of the atmosphere, has a mass of about 1.03 kilograms and that force is a pressure of 10.1 N/cm2 or 101 kN/m2. A column 1 square inch in cross-section would have a weight of about 14.7 lb or about 65.4 N and it is modified by the planetary rotation and local effects such as wind velocity, density variations due to temperature and variations in composition. The standard atmosphere is a unit of pressure defined as 101325 Pa, the mean sea level pressure is the average atmospheric pressure at sea level. This is the pressure normally given in weather reports on radio, television. When barometers in the home are set to match the weather reports, they measure pressure adjusted to sea level. The altimeter setting in aviation, is an atmospheric pressure adjustment, average sea-level pressure is 1013.25 mbar. In aviation weather reports, QNH is transmitted around the world in millibars or hectopascals, except in the United States, however, in Canadas public weather reports, sea level pressure is instead reported in kilopascals. The highest sea-level pressure on Earth occurs in Siberia, where the Siberian High often attains a sea-level pressure above 1050 mbar, the lowest measurable sea-level pressure is found at the centers of tropical cyclones and tornadoes, with a record low of 870 mbar. Pressure varies smoothly from the Earths surface to the top of the mesosphere, although the pressure changes with the weather, NASA has averaged the conditions for all parts of the earth year-round. As altitude increases, atmospheric pressure decreases, one can calculate the atmospheric pressure at a given altitude. In systems involving heat transfer, a condenser is a device or unit used to condense a substance from its gaseous to its liquid state, by cooling it. In so doing, the latent heat is given up by the substance, Condensers can be made according to numerous designs, and come in many sizes ranging from rather small to very large. For example, a refrigerator uses a condenser to get rid of heat extracted from the interior of the unit to the outside air, Condensers are used in air conditioning, industrial chemical processes such as distillation, steam power plants and other heat-exchange systems. Use of cooling water or surrounding air as the coolant is common in many condensers, a surface condenser is an example of such a heat-exchange system. It is a shell and tube heat exchanger installed at the outlet of steam turbine in thermal power stations. Commonly, the water flows through the tube side and the steam enters the shell side where the condensation occurs on the outside of the heat transfer tubes. The condensate drips down and collects at the bottom, often in a built-in pan called a hotwell, the shell side often operates at a vacuum or partial vacuum, produced by the difference in specific volume between the steam and condensate. Conversely, the vapor can be fed through the tubes with the coolant water or air flowing around the outside, in chemistry, a condenser is the apparatus which cools hot vapors, causing them to condense into a liquid. See Condenser for laboratory-scale condensers, as opposed to industrial-scale condensers, examples include the Liebig condenser, Graham condenser, and Allihn condenser. This is not to be confused with a reaction which links two fragments into a single molecule by an addition reaction and an elimination reaction. In laboratory distillation and rotary evaporators, several types of condensers are commonly used, the Liebig condenser is simply a straight tube within a cooling water jacket, and is the simplest form of condenser. Being more complex shapes to manufacture, these types are more expensive to purchase. Soho Pool, by Allen Edward Everitt.